Join us this September 18th for Rooftop Yoga Under The Stars 2016, “it’s all about U” held on the rooftop at Noel Furniture with it’s beautiful downtown skyline view. We will have yoga, shopping, giveaways, swag bags, food trucks, live music and lots of fun! Stay tuned for updates and register today! We hope to see you all for the Third Annual Rooftop Yoga Under the Stars Event for Live Music, The Waffle Bus, and FUN! An awesome time for an even more awesome cause! 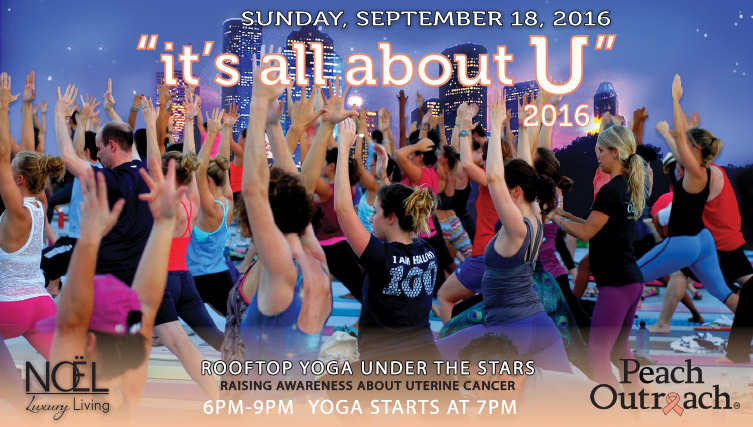 Bring a friend and feel good knowing your investment in rooftop yoga directly supports uterine cancer research! This is your opportunity to help save lives! Tickets are only $30. For tickets and information please click below.